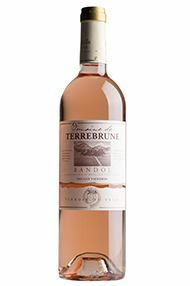 The wine of Domaine de Terrebrune is located in Bandol on the east side of the Provence wine appellation, nearer to Toulon, that is to say than Marseille, in fact close to the town of Ollioles. Terrebrune’s vines are planted on the terraces of the unusually named Gros Cerveau mountain and its soils are made up of limestone and an eponymous brown clay. The domaine is planted with Mourvèdre, as well as Grenache and Cinsault that produce classic Bandol wines.